Kidney donor and warrior Scott Mcvey returned to competing at full strength. Yes, Tim and I grew up together played every day from the time we were 5 or 6 years old until junior high school. After high school, we roomed together in college for a year before we lost touch. I ran into Tim again 25 years later at our old college as I was coaching a baseball team and his son was playing on the opposite team. We spoke for a while and discussed his son coming to play for my team. The next season his son came to play for my team, and that’s when we realized he needed a kidney. He had received one from his sister, which had failed, and his health was declining. My wife and I decided to get tested, and I was a match. My wife is the strongest woman I have ever met; to her, this was an easy choice—I was going to do it. God had meant for this to happen. My daughter follows her mother’s footsteps, and neither of them ever raised a concern about me doing this. It was my responsibility to do since I could. My family is very strong, and it really was not an option. I think if I had changed my mind I would have regretted it for the rest of my life. Yes, very tough. I was afraid I would be affected by the surgery, or that someone in my family would need my kidney at some point in time. My death and not being there for my family, but the fear of not being there to take care of them is one I have all the time. They expected me to do this and supported it 100%. 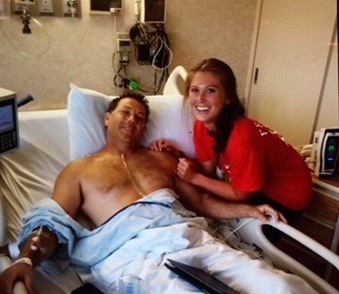 Morgan Mcvey with her hero and dad just hours after Scott's surgery. I really thought I could go home just hours after the surgery I felt so good, but that ended, and I had a day and half of real pain and discomfort from the gas. Once I got home things were better. I had a couple of sleepless nights, but every day it got better. I began to reduce pain meds quickly. Feeling of helplessness not being able to work around the house or take care of the family for a week or so. My daughter was leaving for her freshman year of college just a week after the surgery it took some pain pills to get through that day of moving. I had surgery on Friday I went back to work 10 days later. I just couldn't sit home any longer. It was close to a year, but that was partially my selfishness which I am embarrassed and ashamed of today. I put it off until the end of summer. I think there were some real mental, emotional or psychological changes for a while as my body made up for the loss of the kidney. I look back and realize I was in a different place for a while mentally. I would encourage the having someone to talk to if not family a counselor. I have never felt that way before so I don’t think I realized it at the time. Absolutely, it made me a better person for doing it. My wife and Tim’s wife have become great friends, and Tim is doing great. Knowing that I had a purpose in my life to help someone else live their life better is an amazing feeling. You don’t think about it, you just know you did.